Guard, shunter and footplate crew, with locomotive, c.1900. The railway changed the social and industrial face of the nation, and for a century after 1850 railways were major employers. 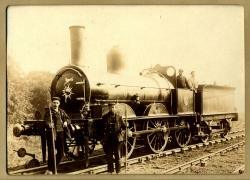 We can show you at Bo'ness what past railways were like. Although we can't show the gigantic scale of much railway infrastructure, we can show you the equipment used in the past, in installations large and small, throughout the land. Railways provided secure employment and comparatively good working conditions that improved steadily through the 20th century. 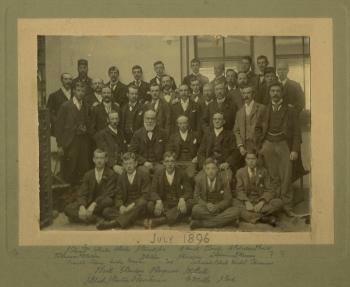 A group of NBR staff, Edinburgh, July 1896. We can't help you directly to find information on a particular railwayman, as our archives do not contain detailed staff records. Extensive records do survive, however, and we can tell you where to look. We have a Fact Sheet which gives suggestions for researching family history in Scotland. It is available, as a PDF or a Word document, from the following links. J. Simmons and G. Biddle (editors), The Oxford Companion to British Railway History, Oxford 1999. This looks like a dry encyclopedia, but contains a wealth of succinctly written information, arranged for easy access. P.J.G. Ransom, The Victorian Railway and how it evolved, London 1990. This is a very readable analysis of why railways developed in the context of their times, and how they changed Britain. P.J.G. Ransom, Iron Road; the railway in Scotland, Edinburgh 2007. John Ransom's latest book offers a very thorough review of Scottish railways from wagonways to the present day. 334 pages, beautifully illustrated. C. Awdry, Encyclopedia of British Railway Companies, London 1990. This unique book tracks the growth of the private railway companies and their amalgamations, including the "grouping" of 1923 which created the LMS, LNER, GWR and SR "Big Four" companies. British Railways Pre-grouping Atlas and Gazetteer, Ian Allan, London. This is the best quick visual reference to the railway system as it existed by 1923. The main archive collection relating to Scottish railways is at the National Archives of Scotland (contact details are given on the Fact Sheet). There are also extensive records at the National Railway Museum (Leeman Road, York, YO26 4XJ, telephone 08704 214001), and at the National Archives Office (Ruskin Avenue, Kew, Richmond, Surrey, TW9 4DU, telephone +44 (0) 20 8876 3444). Before consulting any of these resources, it is essential to do as much research as possible beforehand, so that you know exactly what you are looking for. Much new research has been carried out in recent years, and much remains to be done. Some institutions offer research grants or bursaries, and we may be able to put you in touch if your research subject links to our object collection.